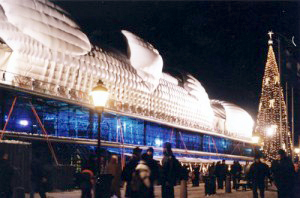 Millennium Arches was the first inflatable building constructed by Lindstrand Technologies using air cell technology back in 1999. It was also the largest self-supporting inflatable building in the world! Designed as a temporary structure in which to host a Millennium Evening party over 500 guests in Stockholm, Sweden, the arches transferred an old customhouse into an amazing party venue, creating an impressive architectural focal point.